Cottage Paper: Celebrate the 4th! The June My Paper Pumpkin kit has a bit of a patriotic theme. (See video link below) It includes red, white and blue pinwheels that can be attached to red and white striped heavy paper straws. After assembling the pinwheels I decided to create a card with a similar theme and the Stylish Stripes embossing folder seemed a perfect choice. I really love this folder. It was introduced in last fall's Holiday Mini and I was very excited when it reappeared in the new annual catalog! I love to put skinny strips of glimmer paper in some of the grooves created by the folder. 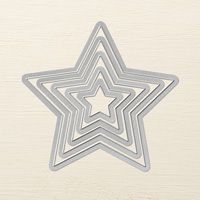 The resulting piece makes a great layer to use on cards that can be used for all kinds of festive occasions. Here is the card I made. You might notice that I used three different embossing folders! 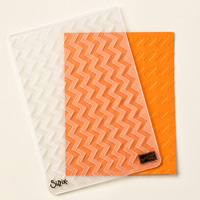 In addition to the Stylish Stripes folder I used the Chevron (another fav of mine for sure!) and Perfect Polka Dots. Trying to remember if I have ever done that! Stars seemed appropriate for the 4th of July and the Stars Framelits were perfect. The cutouts just needed some texture. I had the larger star "bleed off" (that is a term I learned from my graphic design knowledgeable daughter-in-law) the card. For the sentiment I used the "celebrate" that came with the June My Paper Pumpkin but you could use any simple sentiment. MDS has a simple "celebrate" as part of the Cake & Ice Cream download (130867) and it already has a banner. In MDS you can resize as you wish. 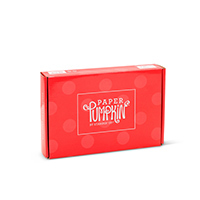 My Paper Pumpkin is a great value if you are interested in receiving a fun project each month that contains all the materials you need to complete a project or if you have limited or no supplies it is a great way to slowly accumulate supplies. You can skip months or cancel your subscription at any time. 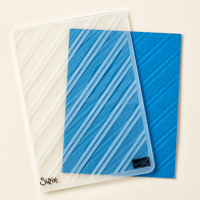 In addition if you are a subscriber you can purchase some of the prior kits or the refills for many of the prior kits. The refills contain everything except the stamps and ink that came in the original kit. Many times you can use the refill to make the project even though you do not have the exact stamps and ink that came in the original kit. In the June kit the project could be done in two different ways and it contained all the supplies for use either way so I had lots of items left over that I could use on other projects. Here is a video showing the kit. I’d love to hear what you think!! I ♥ comments! Leave your thoughts below!